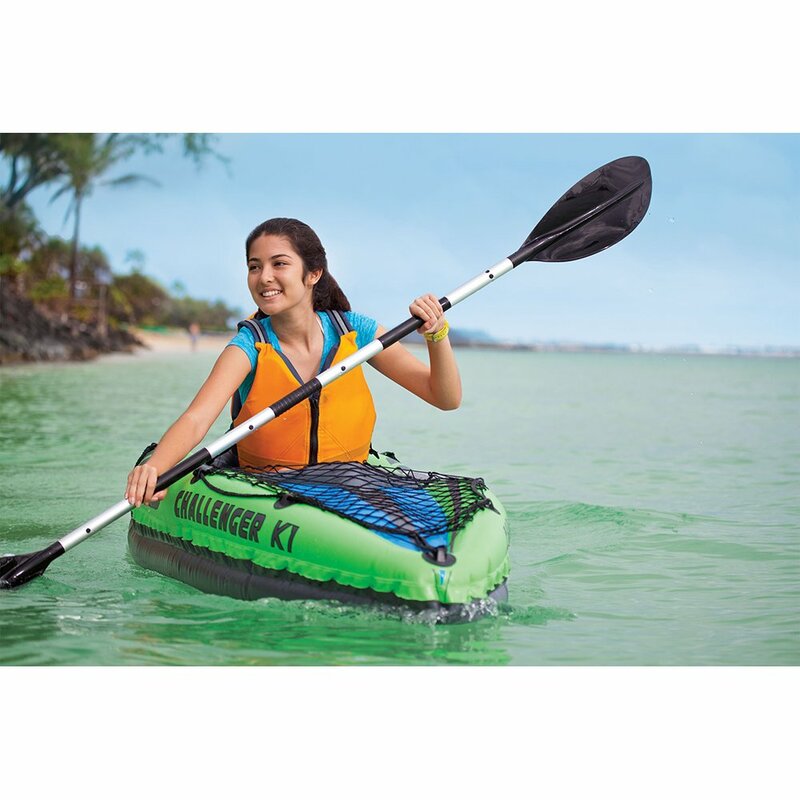 Whether you want to do some fishing, get some exercise done, explore your favorite lake, pond, or river, or are simply looking to have some fun in the water, the Intex Challenger K1 1-person kayak will meet those needs. Durable and easy to transport, the Intex Challenger K1 is a high performance kayak that’s excellent for light kayaking. If you’re looking for the best inflatable kayak for solo adventures, then make sure to read more about this vessel since it offers plenty of features at an amazing price. And thanks to its stability, the kayak can be used by both beginners and experienced kayakers. One of the best features of the Intex Challenger K1 is its level of resistance. Made of firm vinyl material, the kayak is resistant to oil, salt water, sunlight, bumps, wear and tear, and gasoline. Therefore, you’ll never have to worry about issues such as the kayak getting damaged by the strong beams of sunlight or end up ripped and punctured when accidentally grazed by obstacles in the water. Although designed for calm waters, the Challenger K1 has a great cockpit that can easily compete with other long-distance kayaks as well as rough water kayaks. Comfortable, adjustable, and spacious, this cockpit allows you to make any necessary torso and leg paddling movements with ease. As a result, kayaking trips will not leave you exhausted or lead to unbearable back and shoulder pains. This Intex Challenger K1 1 person kayak review would be incomplete without making mention of the roomy design that the vessel offers. The K1 is a great fit if you like taking a lot of supplies or equipment with you during kayaking trips. This is because the kayak has a generous storage space at the back and front. The back area is large enough to fit a small cooler while the front cargo net area can carry a few small-sized supplies. Like most products, the Intex Challenger K1 has both positive and negative reviews on Amazon. However, a majority of the users have expressed satisfaction with the Kayak’s ease of use and performance while on water. Some past purchasers go even further to praise by how resilient the kayak actually is after taking it for a spin. When shopping for a 1-person kayak on a tight budget, there are few options that are better than the Intex Challenger K1. In addition to being affordable, the kayak meets all the qualities that make up a great kayak. It’s secure, amazingly tough, spacious, comfortable, easy to paddle, versatile, and tracks well. Thanks to all these features, you’ll be guaranteed a great time on water.